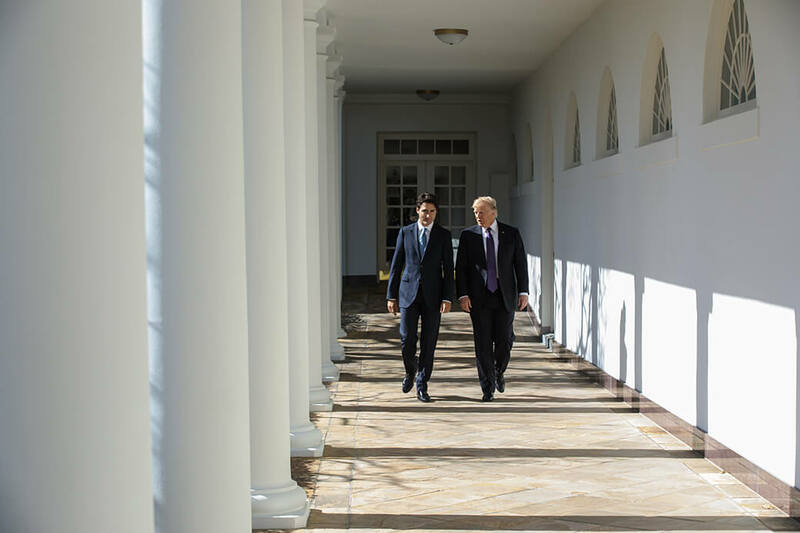 Along with the EU and China, Canada is falling right into Mr. Trump’s bilateral trade-negotiation trap, write Christian Leuprecht and Roger Bradbury. “We will continue to make arguments based on logic and common sense and hope that eventually they will prevail against an administration that doesn’t always align itself around those principles,” Prime Minister Justin Trudeau said in response to recent tariffs imposed by the United States. Canadians are left with the impression that President Donald Trump is an irrational buffoon who is shooting himself in the foot with his trade policies. In fact, contrary to common (and, apparently, Canadian political executive) sense, the U.S. administration’s tariffs are actually perfectly rational – from Mr. Trump’s perspective. The extent of the punitive tariffs Mr. Trump is imposing is unprecedented. They threaten to bring down the system of global trade – by design. The United States has been the guarantor of the free global economy, which dates from July, 1944, when 44 states laid its foundations in the New Hampshire town of Bretton Woods. The United States was the driving force behind a series of long-winded world trade negotiations – beginning in 1947 and continuing through the current Doha round initiated in 2001, but never concluded – that lowered tariffs and barriers to trade. Spreading the free-market gospel across the world would secure the United States’ political and economic hegemony. Today, this meticulously calibrated, multilateral system of rules has 164 member-states and comprises tens of thousands of products. World Trade Organization (WTO) tribunals – which are about to grind to a halt because the United States has not named a judge to the seven-member Appellate Body – were meant to ensure that everyone sticks to the rules. But instead of being bound by WTO rulings, Mr. Trump’s trade czar Robert Lighthizer would prefer to default to the pre-WTO practice of directly negotiating the outcome of trade disputes. The President is now intent on destroying co-operation within the WTO by driving wedges between the world’s trading blocs and countries. The United States would be in a much stronger position if it could negotiate with each trade bloc directly. The painful NAFTA negotiations are but one example, and Mr. Trump’s recent musings about replacing NAFTA with two separate trade agreements with Canada and Mexico are further evidence to that effect. Canada risks selling out the WTO by making concessions to the United States. The President is now intent on destroying co-operation within the WTO by driving wedges between the world’s trading blocs and countries. China, too, is negotiating bilaterally with the United States and is already caving to American demands. In the end, the large trading blocs are likely to divide up the world among themselves; countries with little leverage, such as Canada, could become collateral damage. The timing of Mr. Trump’s moves against China is auspicious: It coincides with President Xi Jinping anointing himself emperor for life and abandoning the progressive master plan for market-based reform for his Agenda 2030 for Sustainable Development, whose strategy clearly aims for Chinese economic dominance. In the international system, states are confronted with two basic choices in how they interact: compete or co-operate. Either states co-operate, form alliances or agreements such as the WTO and grow more prosperous or they compete and take wealth from weaker rivals. Mr. Trudeau believes that the United States should co-operate. Indeed, for decades the United States played by the rules; everyone grew richer and the United States grew richer faster than everyone else. In the postwar world, the United States’ support of free trade was a key – perhaps the key – to its rise to global economic leader. Nowadays, however, the game has changed. Where once the goal of the United States was to rise to global hegemony, today its goal is to maintain that dominance. So, that same rules-based system is now causing competitors – Mr. Trump’s national-security strategy makes no qualms about calling them that – to grow richer faster than the United States. Under these conditions, it is no longer in the interest of the United States to co-operate; as the global political and economic hegemon, the United States can win a strategic competition for wealth and power. Everyone ends up poorer, but the United States remains top dog because everyone else grows poorer faster than the United States. Beggar thy neighbour. Literally. But being frank will not sit well with Canadians; painting Mr. Trump as a crazy buffoon is more politically expedient. So, along with the EU and China, Canada falls right into Mr. Trump’s bilateral trade-negotiation trap. R.I.P. WTO. Score: Trump 1; Canada 0. Christian Leuprecht is a class of 1965 professor in leadership at the Royal Military College of Canada and a Munk Senior Fellow at the Macdonald-Laurier Institute, currently on leave at the Flinders University of South Australia. Roger Bradbury is a professor of complex-systems science at the National Security College at the Australian National University.